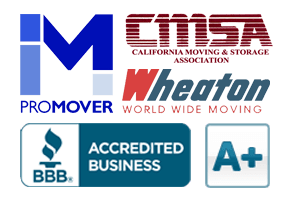 Managing a Moving Sale | Cummings Moving Co. Your move to Redwood City is only a few months away. You’ve started collecting boxes and going through your belongings. As you go through each room, you realize how much stuff you’ve accumulated all these years. How did you acquire so many things? The smart thing to do would be to have a garage sale to cut down on the clutter. Here’s a few tips to help you organize one. • Recruit a few friends to help you sort through your things and start the process. Your friends will help you go through your stuff with an objective eye and encourage you to get rid of items that you’ll never use. Having a few extra hands on deck makes the process go faster and makes it more fun too. • Clean up the items that you want to sell. They might be junk to you but you want buyers to see it as undiscovered treasure. At the very least wipe off the dust or take some time to give a good cleaning and restore it to its original look. If you have the original packaging, that’s even better. This will help you get top dollar for your items! You can make a special table for toys, holiday items and household gadgets that all have their original box in tact. This is a BIG deal to collectors, so make it a selling point at your sale and reap the rewards. • Plan to organize your stuff just like a department store. You don’t want a mound of things all piled up together. Would you want to walk into a huge warehouse of unorganized items? Probably not. Group everything by room or category just like the big retail stores do. For example, sort books, CDs and DVDs by genre and group exercise equipment with your skateboard and tennis rackets. It will make it easier for people to go through everything and encourage them to leave with several items instead of just one or two things. • Get things up on tables and hang up clothes! There is a great hack we know about. To make your standard folding tables taller, buy some PVC pipe just big enough in diameter to fit your table legs. Insert your table leg into the PVC pipe and make a mark 10-14 inches past where the table leg ends. Remove the pipe and cut. Then cut extensions for the other legs. These leg extensions will help get your sale items up closer to eye level and make it easy for folks to shop. When you hang up your clothes, at least the better items, it creates more perceived value and makes it more likely that people with buy them. • You need to let the whole world know about your garage sale. Advertise, advertise, advertise! Put an ad in the local newspaper or create a post on Craigslist. Make sure you state the location, date and hours correctly and use photos. Typically, garage sales are held on the weekends. Give a brief description of what items will be at the garage sale so spark some interest. Most importantly, be honest and truthful about the things you’re selling. Placing flyers and signs strategically around your neighborhood will help as well. • Put a price on everything! You can have a lot of people show up at one time who will all end up asking you for the price of items. Avoid going through this and have price tags in place. People will probably still negotiate price but at least they know where you’re at. Set your prices at a reasonable amount and think of your end goal, which is to get rid of everything that you possibly can. 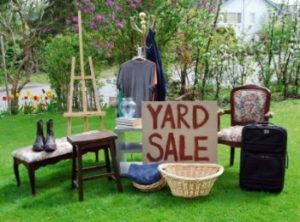 • If you are in the middle of selling your house, it might be a wise move to see if you can host your yard sale in the neighbor’s yard. This will allow you to continue showing your house at any given time without yard-sale shoppers getting in the way. Make sure you put away any items that you don’t plan on selling. The last thing you want happening is accidentally selling something that you value dearly. • Get the kids involved. You can always use an extra pair of hands. Encourage children to get rid of their old belongings by letting them keep the money from the sale or letting them know that the proceeds will be used for the benefit of the entire family, like a new flat screen television. If you have younger kids, make sure there is an adult or older sibling supervising them. • Have change readily available. You certainly don’t want to run out of change during the yard sale. Figure out how many people will be involved and head to the bank for smaller bills and some coins. All of your assistants should have their change ready to go! • Be prepared for the early birds. If the sale is at 8 a.m., expect people to be there at 7 a.m. or earlier, so FINISH setting up a full hour BEFORE your published start time. Be prepared to sell from the moment the first item is laid out on your lawn. Everything should already be priced and your friends that are helping need to get there ahead of everybody else. • Donate what you’re left with. Ideally, we would love to get rid of every little thing. More often than not, you’re left with a handful of items that you really have no use for. Either give it away to the friends that have been helping you or find a charitable organization that needs them.